Like Carl Perkins, Roy Orbison was unable to find a follow-up to his first hit. He recorded "Rockhouse", a song that another aspiring Sun act, Harold Jenkins (a.k.a. Conway Twitty), had worked up as a theme song for his group, the Rockhousers. It was coupled with Johnny Cash's execrable song, "You're My Baby", originally "Little Woolly Booger". Billboard once again was effusive in its praise of Orbison's "sock showmanship", but its recommendation failed to take account of the fact that "Rockhouse", released in September 1956, was already behind the times. Roy Orbison makes a return engagement as a rockabilly singer here, but failed to capitalize on the momentum of "Ooby Dooby". Despite his prowess as a songwriter, Orbison turned to outsiders for this both sides of this disc. Its plain that he knew his way around the bluesy stop rhythm of "You're My Baby". In contrast, there is nothing funnier in the Sun archives than listening to Johnny Cash stumble his awkward way through the original demo of this tune. Kenny Parchman came achingly close to having a record on Sun. Two songs were cut, publishing contracts were signed, recordings were mastered, assigned an issue number, scheduled... then cancelled at the last moment. For years the mystery of what was intended to be SUN 252 beguiled collectors. Then a Sun master number listing seemed to indicate that it was to be Kenny Parchman, and then a safety tape of compiled masters for SUN 251, 252, and 253 put the issue beyond doubt. With nearly 40 years' hindsight, it is clear that these sides would have broken no new ground for Sun. Parchman's style is credible, if a bit mannered and lightweight. The truth is, if a Sun record from the 250 series had to be lost, better this than "Ubangi Stomp". Parchman came back to 706 Union to record again, although release of his work had to wait for Sun archaeologists a quarter century later. Still very much in her teens, Barbara Ann Pittman earned her professional grounding in familiar Memphis nitespots such as the Eagles Nest and the Cotton Club. She fronted an outfit led by local drummer Clyde Leoppard and several of his sidemen were on hand when her inaugural recordings were made at 706 Union. There was little doubting what she had in mind with this title, to wit, the light soprano she'd been displaying on stage was convincingly replaced by a hot-blooded growl. Not many Sun labels have borne the names of women. One side of Barbara Ann Pittman first Sun single (several records later appeared on Phillips International) was a conscious attempt to expand the boundaries of rockabilly to include female vocalists or, as Billboard called it, "the backshack sound, female style". Along with Janis Martin, Wanda Jackson and several others, Barbara Pittman has been dubbed a "female Elvis". She was indeed a chum of the King, but as an artist she was much more. This track presented here in its original as well as several alternate forms, offers an interesting and unusual blend of styles. The sound of 1950s pop is obvious in the vocal chorus and Hank Byers trumpet solo, but it is blended with some Memphis country (Stan Kesler's steel guitar is prominent). The final surprise is Barbara's unexpectedly sultry, late-night voice, which takes this under-rated record to a whole different level. Few records in 1956 were as unassumingly hybridzed. Ray Harris' unbridled enthusiasm comes through on both sides of his debut Sun single. The instrumental work on these sides, while spirited, is thin - even by Sun's spartan standards. If there was a bass player on this session, he might have been in Taylor's Cafe next door when they nailed these takes. There is a priceless anecdote about Ray Harris, practicing his vocal craft in a non-air conditioned Memphis apartment in July, standing in his overalls, dripping with sweat, bellowing his heart out to his undeserving neighbors. Folks living blocks away got to preview an a cappella version of these sides, which Billboard later called "dangerous". All the practicing apparently paid off for Harris, whose voice Billboard described as "extreme" and "emotion packed". In his more staid later life, Ray Harris spent years as the resident engineer at the Hi Records studio across town. In its original 45rpm form "Come On Little Mama" proved to be a serious challenge for the avid listener as the single was pressed on particularly low grade vinyl. Only in recent years, with the advent of the digital format, has it been possible to soak up the full impact of what Ray Harris first set out to archieve. As a point of interest, his right hand man was a fine guitarist by the name of Wayne Gogswell who saw success of his own when he penned "Teensville" for Chet Atkins. "Come On Little Mama" was one of the original Holy Grail Sun singles... and with good reason. Its one of the most berserk records of the era. Ray Harris took his song to Sun. Sam Phillips, surely knowing that he couldn't sell Harris to the mass market, nevertheless responded to his maniacal energu. "I'll never forget it, he was so intense", says Phillips. "Ray was a very intense person. He really put himself into it. He looked like he was going to have a heart attack every time he played. 'Rack 'em up, boy, let's go!. That was Ray's saying". Here was a prime opportunity for Sun to tap into the growing teenage market rather than service a faltering country audience. Sax replaced fiddle as the sidemen, this time largely made up of players from Johnny Bernero's band, worked hard to make the track jump accordingly. Vocally-speaking the girls exude a great deal of savvy which gained them an entirely new mantle, far removed from the indigenous harmonies that had set the standard on their earlier releases. "Ten Cats Down" was about as close as the Sisters ever came to rock and roll. They were, first and foremost, a country act and while they had an admirable feeling for the blues (listen their version of "Got You On My Mind") they were never fated to climb onto the emerging rock bandwagon. Even Ace Cannon's sax meanderings sound curiously stilted. Slim Rhodes was really a misnomer on the Sun label. Sandy Brooks, aka Ronnie Hesselbein, is the artist of note. Slim was nothing if not a survivor. Here, his aggregation makes a valiant effort to come to terms with country music's crossover into pop ballads and rockabilly. Although Brooks offers credible emotional and breathy warbling on this both sides of the record, the band's capacity for teen music is streched to the breaking point. The ballad side, "Take And Give", reveals steel player John Hughey, who later joined forces with Conway Twitty, to be an engaging and inventive musician. Drummer Johnny Bernero adds a wonderful, if underrecorded shuffle rhythm to the proceedings, and contributes a memorable rimshot just before the first steel solo. 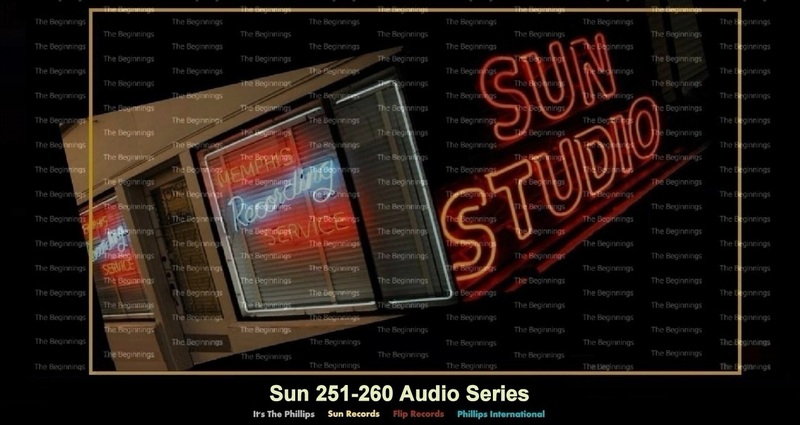 Few Sun records employed as many minor chords as "Take And Give". The record itself has a commanding presence from its driving intro to the final major 7th chord. It features a surprisingly pounding rhythm, virtually none of which is due to the drumming! What the drummer does contribute is a memorable but almost throwaway rimshot on the snare right before the first steel solo. The steel playing throughout is delightful, with swelling chords complementing Brooks' vocal. The song features an almost completely expendable lyric, but a full assortment of 6-minor chords to give it that haunting quality that might have carried it over into popular success. Rosco Gordon used his larynx more as an instrument than as a vocal attribute: Witness his gargling fluid delivery on "Cheese And Crackers". Even more oblique is the rolling piano intro, which conjures up the accompaniment to a silent movie - the part where the villain makes his entrance. There must have been a permanent high at Sun cutting records like this. It was a long seven months before Johnny Cash's next record hit the marketplace. Such was the continuing success of "I Walk The Line", that Sam Phillips wanted to wring every last play and sale it afforded before releasing Cash's next effort. The wait was worth it. This is a truly superb two-sided record, revealing all the dimensions of Cash as a performer and composer. Roland Janes - Guitar off-mic on "Grazy Arms". Billy Riley - Guitar last note on "Crazy Arms"
In 1956 Ray Prize had a number one country hit and million-seller with "Crazy Arms" (Columbia 21510) produced by Don Law. The song, which was written by Ralph Mooney and Chuck Seals, peaked at number 27 on the Top 100 chart. Mooney wrote "Crazy Arms" after his wife temporarily left him because of his drinking. In 1963 Marion Worth had a number 18 country hit with his rendition (Columbia 42703). On this track Elvis and Jerry Lee Lewis sang a few lines of "Crazy Arms" during this Million Dollar Quartet session on December 4, 1956. Just three days earlier, Sun Records released "Crazy Arms" as Lewis's first record (SUN 259). "Crazy Arms" must have sounded decades old the moment it was released, for Ray Price spends the whole record on the edge of a pure Jimmie Rodgers yodel and the fiddles and steel guitar belong to another era, one in which Elvis and Little Richard are barely conceivable, much less standing at center stage. On the other hand, the concept of the pop star as a person on the edge of insanity has some of its most important roots in just this kind of country record, in which the singer confesses - and genuinely seems to feel - that his behaviour is a form of madness, that he has little or no control over what his body is going to do even though his mind (or at least, his conscious moral sense) urges him in a more godly (or at least sensible) direction. You tell me the difference in attitude between that posture and many random heavy metal band's. It didn't take long for Jerry Lee and teenage drummer Jimmy Van Eaton is forge a musical alliance. They had it here, the first time they met and recorded. Exactly which titles were recorded and in what sequence is a matter of conjecture at this point. One thing we can be sure of is that by the time they reached ''Crazy Arms'', which became Jerry Lee's first Sun release, they were soaring together. There was nobody there to fill in the blanks: no bass, no guitar, no strings, no voices. Just Jerry and Jimmy, whose combined ages at this point didn't total 40 years. Van Eaton is doing so much more than keeping time, it's almost comic. He's kicking and prodding, and providing drum rolls and counter-rhythm. It's like having Jerry Lee accompanied by a marching band. When Jerry launches into his 16-bar piano solo, J.M. follows suit and begins to solo on his drums. Much of what Van Eaton does here he would continue to do for the next seven years in the Sun studio, but never so much of it in such a compressed time and place. ''Crazy Arms'' runs under three minutes (2:45, to be exact) and there's enough drumming to fill a dozen records. The amazing this is neither of these young men knew exactly what they were doing. They were ''feeling each other out'' musically, taking risks, seeing if the other would follow. "End Of The Road" was the flip side of Jerry Lee Lewis's first record at Sun Records (SUN 259), which was released on December 1, 1956. The A side was "Crazy Arms". Lewis sang "End Of The Road" (his own composition) during this Million Dollar Quartet session on December 4, 1956, accompanying himself on piano. Elvis and Carl Perkins did not participate in this song. Note: "Flyin' Saucer Rock And Roll'' (misprinted as ''Saucers"" on the record label. When Sam Phillips pressed the red button on his Ampex tape machine to record Billy Riley's single, he was taking the plot of a sci-fi drive-in movie and turning it into a mesmeric rock and roll classic. The elements that he'd gathered together were right on target. Riley's hoarse throat vocal, Jerry Lee's freestyling at the studio upright and Roland Janes, with his eerily-echoed whammy bar, were enough to frighten anyone's horses. No wonder they were dubbed "The Little Green Men". If you were a song, even one as sweet as ''I Want You Baby'', how'd you like to get stuck on the flipside of ''Flyin' Saucer Rock And Roll''? Talk about being invisible! It is very easy to underestimate to this record. The lyrics won't make anybody forget about Cole Porter. The sound has that "live in the studio, cooked up spontaneously" quality. The results are endearing but just as easy to discount. Sun couldn't havepicked a more perfect B-side for ''Flyin' Saucer Rock And Roll''. It would have been a rare disc jockey who listened to this and decided to divert his attention from the A-side. Ask yourself: What category of music is this? Everyone knows that Sun produced hybrids, but how would you label this track? Is this country? Rock and roll? Pop? A large part of that confusion stems from Roland's wonderful guitar playing. Some of the alternate takes push the results closer to either country or rock, but the original 45 contains just the perfect measure of confusion.